I am the type of person for whom yoga is recommended. I wouldn’t say I am Type A (more like A+) but I’m pretty fast-moving and a bit enthusiastic. When I was young enough to still see a pediatrician, I asked the very patient Dr. Toback what my blood type was. I was told A- (A negative) I asked where I lost points and how I could turn that A- to an A+. I wrote about this tendency a few weeks ago. But I do like yoga. I often don’t include it in my weekly workout regimen. This is probably a mistake. I like to feel the burn, and to sweat. I think if I had a larger supply of time, I would do more yoga. But I don’t like substituting it for something more intense. Maybe this is why I am always injured. 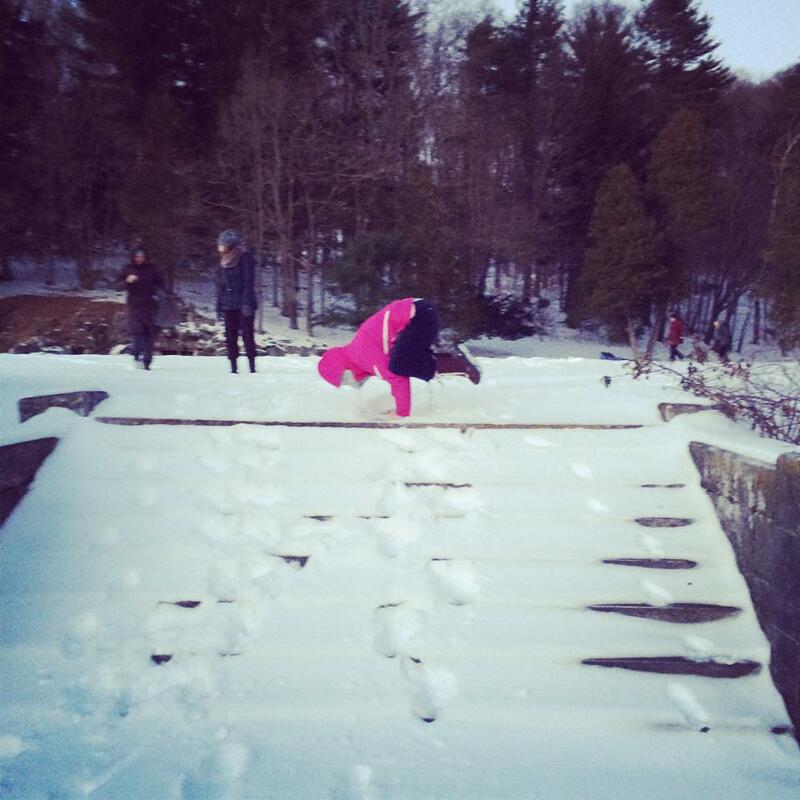 Two weekends ago I went to a weekend yoga retreat at Kripalu in Stockbridge, Massachusetts. 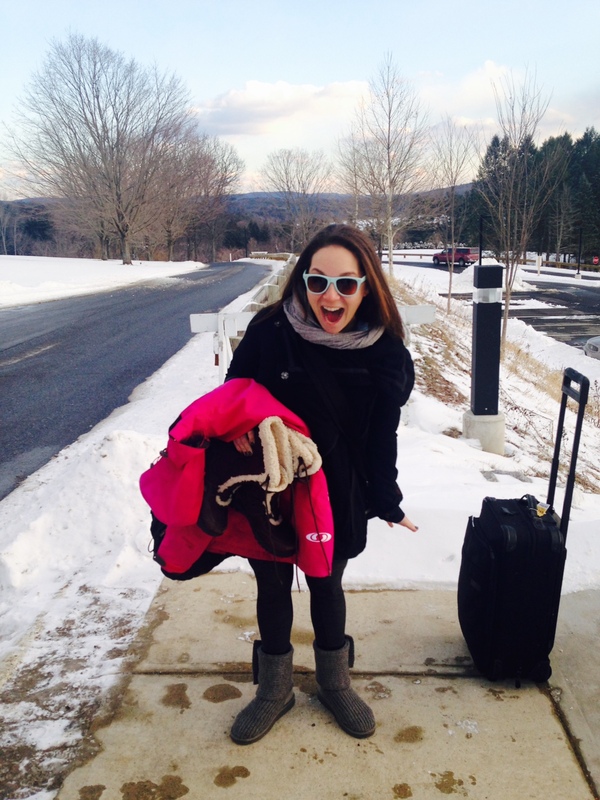 Specifically, I went to Jillian Pransky’s Winter Renewal weekend. My friend Jamie had gone to this retreat two winters ago and loved it. When she invited me to join her this year, I didn’t ask too many questions and signed up. I am a yes person. So I have that going for me. I didn’t know what to expect but I thought it would be a calming re-set. The drive to Kripalu from NYC is about 2 hours. We arrived at 4pm, seamlessly checked in and quickly got settled in our spartan but totally fine room. There are Kripalu-hosted (versus retreat-scheduled) yoga classes at 4:15pm on Friday and we hopped to it. There are three levels: Gentle, Moderate and Vigorous. We chose Gentle because Jamie said it was in the prettiest room. Fine by me. After the class, which was in fact very gentle (we were the youngest ones there by 30 instances of arthritis) we headed to dinner. 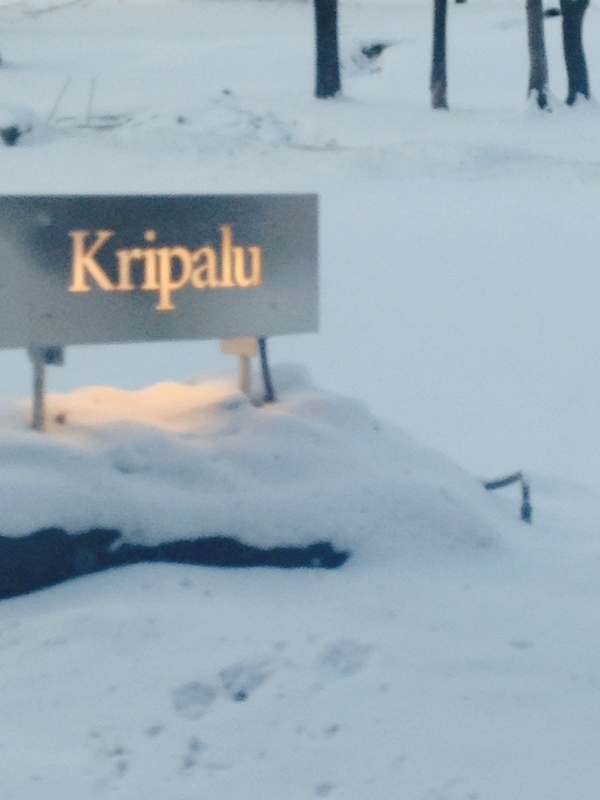 I had heard the food at Kripalu was good, and it IS GOOD. It’s also the exact way I like to eat. Lots of uncooked- vegetables and everything is clearly labeled. It’s not vegan or forceful; you can find meat and cheese for sure. What I loved was that every prepared food had a list of ingredients so each diner could make his/her own call allergy/food preference wise. At 7pm we headed to our first session led by Jillian. The two hour session was a mix of talking, meditation and yoga. 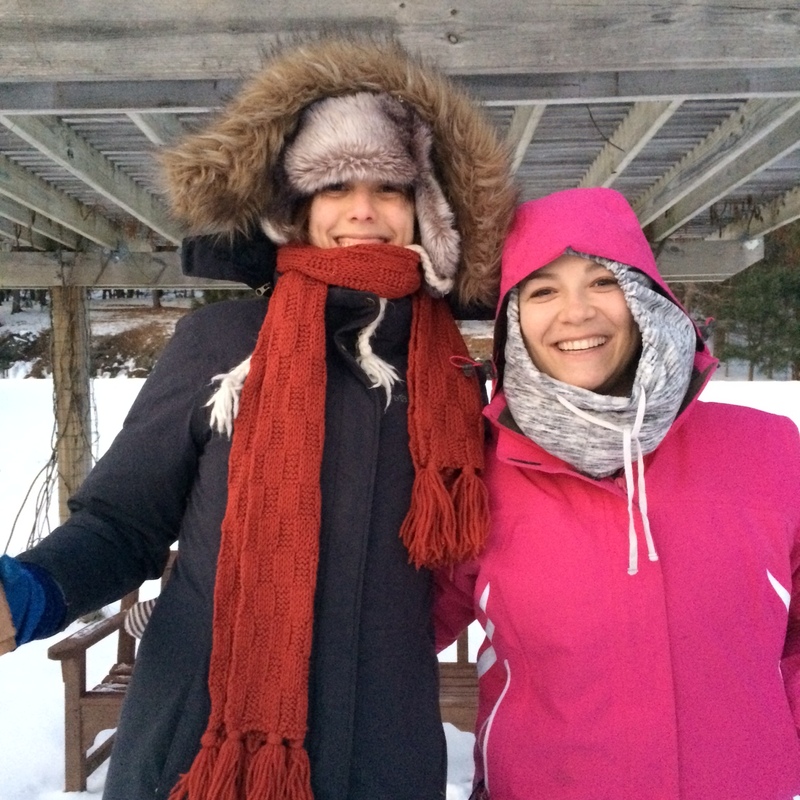 Jillian does a retreat each season focused on the way the body responds to each seasons. In winter, she posits, the body restricts and slows, and we should both go with it and also provide counter balance. I slept like a baby that night. I took a Physique class that morning, did the abs challenge, followed by two hours of slow yoga and was totally tuckered out. The next morning breakfast started bright and early. Did I mention it was a silent breakfast? That’s how they roll at Kripalu. I discovered the chai tea at breakfast. It was so delicious. I didn’t mind the silence at silent breakfast, but I felt the lack of talking muted everyone’s senses. Multiple times I found myself tripping on someone who had stopped abruptly in the middle of the dining hall, suddenly lacking a spatial awareness present at other meals. I wanted to say “hey!” but I didn’t say anything because I love rules. After breakfast was a 3-hour session with Jillian: a mix of slow yoga, meditation and deep relaxation. I think I fell asleep during that last part. But delightful yogic sleep, right? Do keep in mind this happens in the cold light of day, before lunch accompanied by an 8-person drum team. After dinner and the evening yoga session (which featured live music by some cat named Garth Stevenson who all the yogis seemed to want to throw their seamless underpants at) I went to the Healing Arts center. Healing Arts is hippy for spa. I went to the spa and had a massage at 9pm. Which if you ask me is a superb time for one. The massage therapist and I had a slight disagreement when I wanted her to just abuse my calf (my calves are made of rocks) but it was otherwise a delight. On Sunday, the final morning, Jillian led a restorative class. Restorative is my favorite kind of yoga. Lots of long stretches supported by pillows. Oo. La. La. 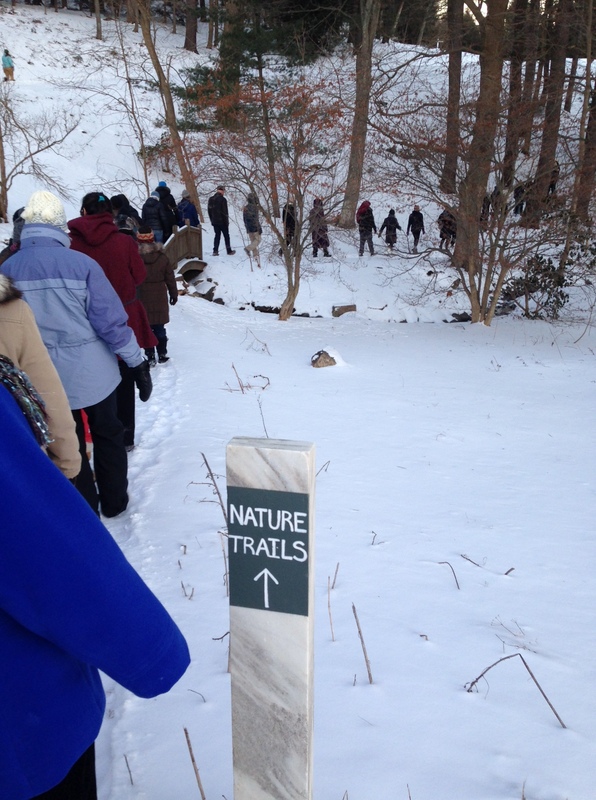 In the afternoon, we took a short walk through Kripalu’s snow-covered property for a fire ceremony. What IS a fire ceremony? Hmm good question. This explains it well. If I didn’t dislike the smell of burning sage, I might have liked it more, but it was good to be outside. The weekend was incredibly relaxing. It’s very unique to be in an environment for 48 hours where the goal is to purify your thoughts and slow down. We spent a chunk of time focusing on “letting go” of baggage and stress. 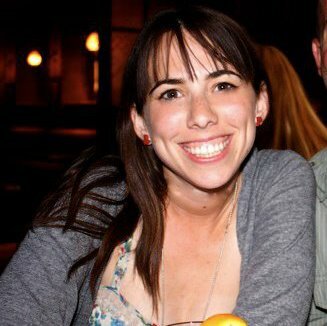 Jillian was calm and a great yoga instructor without being detached or inaccessible. She joked around and showed she was a real person, not a bendy-perfect creature. The weekend worked on me. Have you ever gone to a yoga retreat?